US President Donald Trump allegedly offered NASA unlimited funding to get humans to Mars by 2020. The former Director of White House Message Strategy for the US President, Cliff Sims, made the claim in his new book, Team of Vipers: My 500 Extraordinary Days In The Trump White House. As reported by The New York Times magazine Intelligencer, Sims alleges Trump offered the funding during a televised call to the International Space Station. On April 24, 2017, Trump video called the station to congratulate astronaut Peggy Whitson who, that day, broke the record for the longest time an American had spent in space. Everything was going smoothly until the president got distracted by fantasising about going to Mars before the end of his first term in the White House. He asked the astronauts ‘tell me, Mars — what do you see as a timing for actually sending humans?’, with Whitson responding by pointing out Trump had signed a bill a month earlier outlining such timings. She said, ‘well, I think as your bill directed, it would be in the 2030’s, unfortunately spaceflight takes a lot of time and money, so getting there will take some international cooperation’. According to Sims, Trump was unhappy with the response saying, ‘well, I think we want to do it in my first term or at worst in my second term’, adding that ‘we’ll have to speed that up a little bit’. We don’t capture people’s imaginations anymore. We used to do big things — incredible things. No one could do the things we could do. You have to inspire people. They went to the moon. But the call would be great. Honestly, how cool is NASA? Of course, as Sims states, the US ‘hadn’t landed an American anywhere remotely close to Mars ever’ so sending humans to the red planet by 2020 would be a stretch. However, time didn’t concern Trump making an offer to Robert Lightfoot Jr., the acting NASA administrator, who was also in the room. But what if I gave you all the money you could ever need to do it? What if we sent NASA’s budget through the roof, but focused entirely on that instead of whatever else you’re doing now. Could it work then? Lightfoot told Trump he was sorry, he didn’t think it was possible which left Trump, as Sims writes, ‘visibly disappointed’. In an interview last year, NASA’s chief historian Bill Barry told UNILAD they plan to send people to the Moon first, then Mars. We plan to send people to to the vicinity of the Moon within the next decade or so, in the 2020s we will be orbiting the Moon working with both commercial and international partners, able to send people to the surface of the Moon. We will eventually have people walking on Mars and a much more robust economy with multiple space stations and people even working on the moon. That is where the US government has told NASA to go, we are talking to the UK space agency etc and they are all on board with the idea. 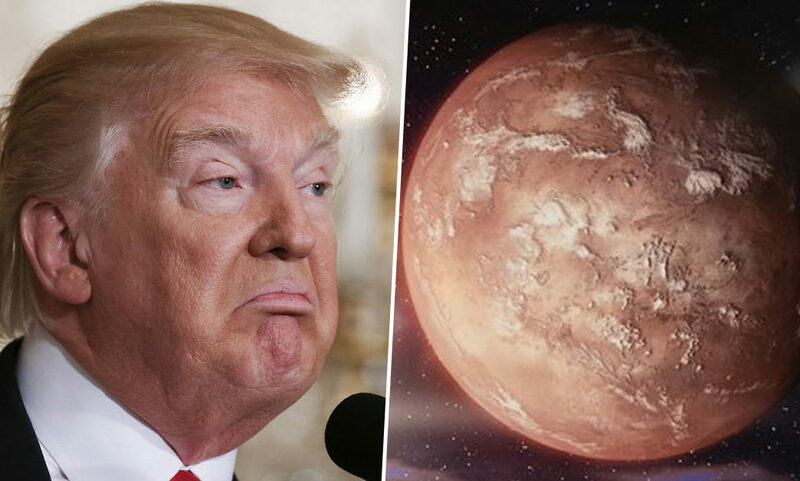 Sorry Trump, it looks like you will have to wait until the 2030s for that trip to Mars. The White House did not respond to The New York Times’ request for comment.